Clyde – Thomas “Tommy” Littleton Gooch, 79, passed away at his residence and went to his heavenly home on Monday, February 11, 2019. A loyal husband and father, Tommy was a native of Carroll County, Tennessee and a son of the late Benjamin Rufus and Tessie Mae Hampton Gooch. In addition to his parents, he was preceded in death by his wife, Frankie Early Gooch, who died in 2008; and two brothers, B.R. and Lynville Gooch. Tommy graduated from Clarksburg High School in 1957 and attended Business College in Sevierville, Tennessee. He worked for 33 years for the Federal Highway Administration retiring in 1994, North Carolina Department of Transportation and retired in 2006. 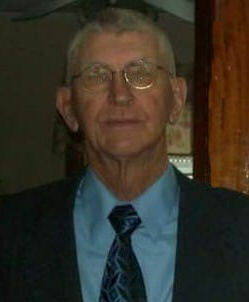 Tommy was a member of West Canton Baptist Church and enjoyed riding motor cycles, playing golf, and was a pool shark. He is survived by two daughters, Tammy Gooch of Middleburg, Florida and Samantha Sellars and her husband, Mitch, of Clyde; two sisters, Ruth Gooch Turner and her husband, Harvey, and Mary Sue Rush, both of Huntington, Tennessee; one sister-in-law, Jean Gooch; two grandchildren, Elizabeth Rich and her husband, Brett, of Canton and Dustin Sellars and his wife, Mary, of Clyde; and 3 great-grandchildren, Kaley Rich, Kaiden Rich and Everett Sellars; nephews and nieces Michael Rush, Jane Rush Meggs, Susan Rush Sanders, Kenny Rush, Johnny Rush, Ralph Rush, Mark Gooch, Kerry Gooch, Lori Whitaker, Barry Wall, and Lynn Wall; his granddogs, Brooke and Scrappy Gooch; and his dog and best friend, Zoey. Funeral services will be held at 12:00 noon on Saturday, February 16, 2019 in the Canton Chapel of Wells Funeral Home with Mark Gooch officiating. Burial will follow at Bon-A-Venture Cemetery on Old Clyde Road. The family will receive friends from 10:00 a.m. until 12:00 p.m. prior to the service at the funeral home. Serving as pallbearers will be Dustin Sellars, Brett Rich; Wally Lovelace, Barry Wall, Daniel Short, Kerry Gooch, and Mark Gooch.